We could talk about food and cooking all day. It’s important, however, to remember that food impacts more than just our taste buds. Today, we answer the question: what are the health benefits of grass-fed beef? Grass-fed beef has gone mainstream, and for good reason. Despite being more expensive than grain-fed beef, consumers realize that the cost of food goes beyond the sticker price. Grass-fed beef is simply a better, healthier option than conventionally-raised beef. First, a word about cows. Cows are ruminants, with a digestive system far different from our own. We’ll spare you the details, but with four stomachs and unique functional properties, cows can do something we can’t: digest cellulose (plants and residues) and convert it to protein. That is, cows are built to eat grass. They’re happy and healthy when they do. Cows are not evolved to eat corn or grain. After 6 months of life, conventional cattle are forced to eat grain and corn to expedite weight gain at a lower cost. This means cows get sick with conditions including liver damage, acidosis, and blood disease. As a result, cows are given large doses of preventative antibiotics in their feed. Feedlot conditions are stressful and unnatural. Rather than being bred on pastures, as nature intended, cows are packed into close quarters and in unsanitary conditions. With these considerations, it’s only logical that grass-fed, pastured cattle produce a superior product. We’ll dive into the headlines, but there’s no lack of detail elsewhere. For the academics, check out the excellent meta-study published in Nutrition Journal. Eat Wild is another comprehensive resource for detailed studies and research. We don’t believe fat or calories are the end-all, be-all when it comes to health. However, many Americans struggle with weight and associated health conditions. Weight always comes down to calories in vs. calories out. A 6 oz steak from a grass-fed cow can have 100 fewer calories than the same cut from a grain-fed steer. And grass-fed beef can have 1/3 as much fat as grain-fed. Not all fat is created equal. Many of us grew up with the misplaced notion that FAT is bad. Now we know that it’s much more nuanced. Indeed, fat is a critical component to good health. Grass-fed beef has a significantly different – and superior – fat profile than conventional beef. Grass-fed has lower overall fat content; specifically, it’s lower in the saturated fat that’s historically linked to heart disease. Meanwhile, grass-fed is higher in the “good” fats: Omega-3s and Conjugated Linoleic Acid (CLA). It also has a healthier ratio of Omega-3 to Omega-6. More on this below. Maybe not everything, but almost. These fatty acids include EPA, DHA, and ALA. Fatty acids cannot be synthesized by our bodies and must be obtained from food. They’re critical to functioning, but also impart significant health benefits. An estimated 40% of Americans don’t get enough Omega-3s. How do Omega-3s benefit your health? A diet rich in Omega-3s is linked to lower blood pressure, lower risk of heart attack and cancer, reduced inflammation, and improved conditions in a number of brain issues, including depression, schizophrenia, ADHD, and Alzheimer’s Disease. Meat from grass-fed animals has 200 – 400% more Omega-3 fatty acids than meat from grain-fed animals.Moreover, grass-fed beef has a healthier Omega-3 to Omega-6 ratio (2:1 vs. 14:1; a ratio of 4:1 or lower is ideal). Grass-fed meat is recognized as the richest known source of CLA, another type of good fat. And we mean GOOD. CLAs are linked to reduced risk of diabetes and reversal of arteriosclerosis, as well as cancer-fighting and anti-obesity mechanisms. Yup, some studies show that CLA can cause fat loss and improved body composition. Meat from grass-fed animals contains 300 – 500% more CLA than conventionally-raised animals. Across the board, when compared to grain-fed beef, grass-fed beef has higher levels of essential vitamins, minerals, and antioxidants. Most Americans are deficient in Vitamin E, a nutrient linked to lowered risk of heart disease, cancer, and anti-aging properties. Grass-fed, pastured cattle have 4 times the vitamin E than feedlot cattle. Even when feedlot cattle are given vitamin E, grass-fed beef still has twice the level of vitamin E.
Grass-fed beef has a 700% increase in carotene. Carotenes are precursors to Vitamin A, a critical component in multiple systems, including vision, bone growth, reproduction, skin, and immune function. 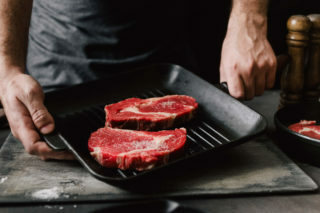 On top of that, red meat is an important source of essential amino acids, vitamins A, B6, B12, D and minerals including iron, zinc, and selenium. Mineral content has been found to be higher in grass-fed beef across the board. We know it’s an icky topic, but important nonetheless. Suffice to say that, according to Consumer Reports, grass-fed beef is less likely to be contaminated with S. aureus or E. coli bacteria, and a lower likelihood of contamination with drug-resistant bacteria. We’ll leave it at that and let you make the choice. 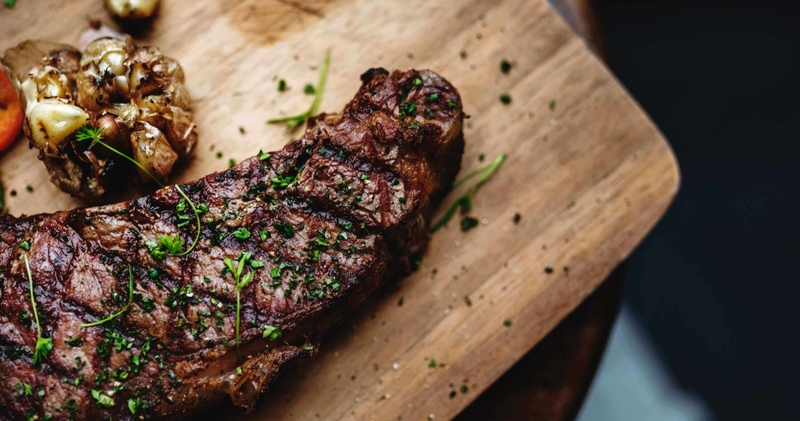 We certainly don’t recommend beef at every meal every day, nor do we suggest that eating grass-fed beef replaces a well-rounded diet and regular exercise. But given the evidence above, to us, it’s clear: grass-fed beef is simply better. It’s better for you – and better for the animals, the farmers, and the environment. More on that later. In the meantime, we’ll get back to the mouth-watering recipes you want so you can enjoy the healthier alternative: Verde Farms grass-fed beef, 100% pasture-raised.